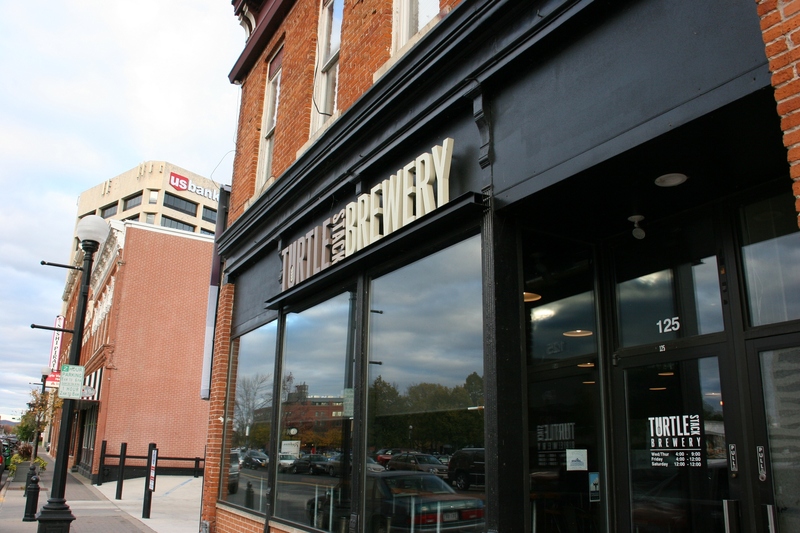 Turtle Stack Brewery, 125 Second Street South in downtown La Crosse. FROM PREVIOUS VISITS to La Crosse, Wisconsin, I don’t recall the downtown as crazy busy as last weekend. Friday evening we circled block after block after block trying to find a parking spot near a newly-opened brewery. Construction doesn’t help. But even without that, there seems an obvious shortage of street-side and other free parking spaces in this Mississippi River town. Randy’s flight from Turtle Stack Brewery. After finally securing parking, my husband, our daughter Miranda and I popped into Turtle Stack Brewery, one of La Crosse’s newest breweries. For a Friday evening, this sparse place with shiny wood slab tables supported by pipe was surprisingly quiet. Randy and Miranda ordered a flight of four brews while I selected a single sample. After tasting the beers—ranging from lager to ale, stout and IPA—we weren’t raving about any of them. Not that we are experts. 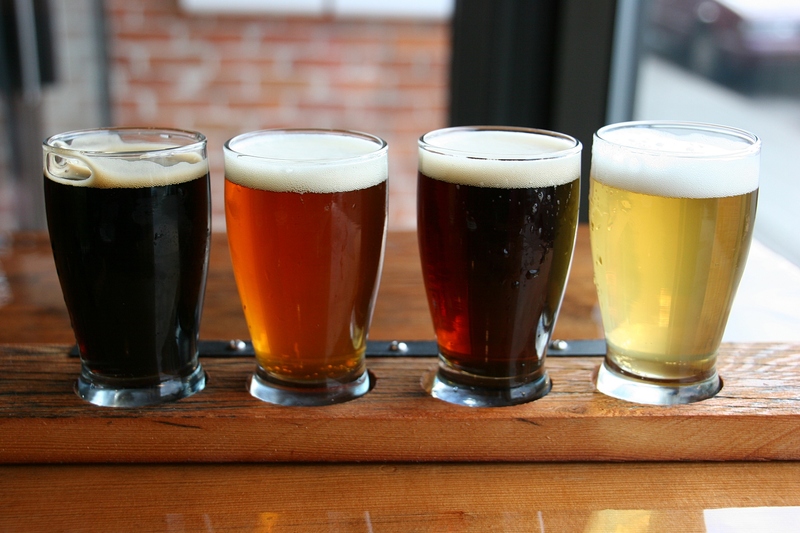 But we’ve each tried enough craft beers to know when we really like a brewery’s offerings. Buzzard Billy’s, 222 Pearl Street. It’s frustrating to see empty lots like the one next to Buzzard Billy’s with signs threatening towing if you park there and aren’t a customer of the business owning the space. And, yes, that’s a parking ramp. But we didn’t want to spend money for parking when we were already dropping a lot of money downtown. 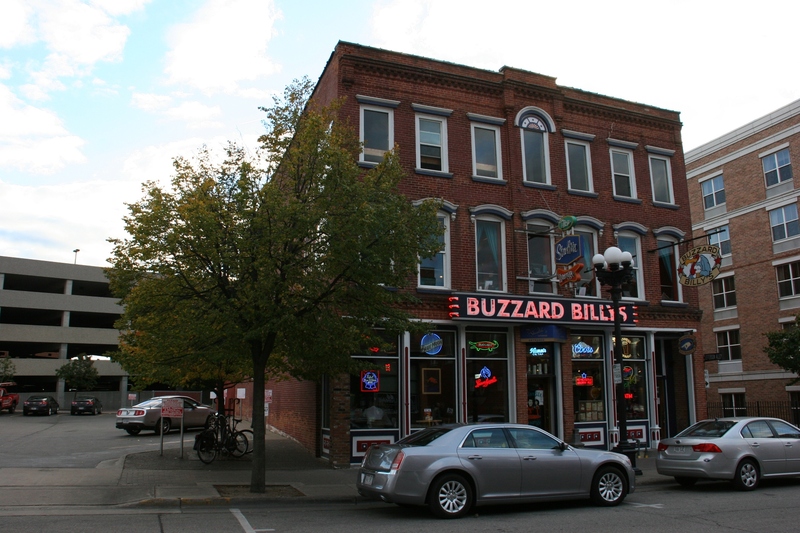 From Turtle Stack, we headed around the corner for dinner at Buzzard Billy’s, a favorite of Miranda, who’d eaten there while attending the University of Wisconsin, La Crosse. Normally I would not wait 45 minutes to be seated. But I determined that Creole and Cajun food would be worth the wait. So we secured our spot in line then crossed Pearl Street to check out The Cheddarhead Store, source of Wisconsin cow and cheese related merchandise including cheese. 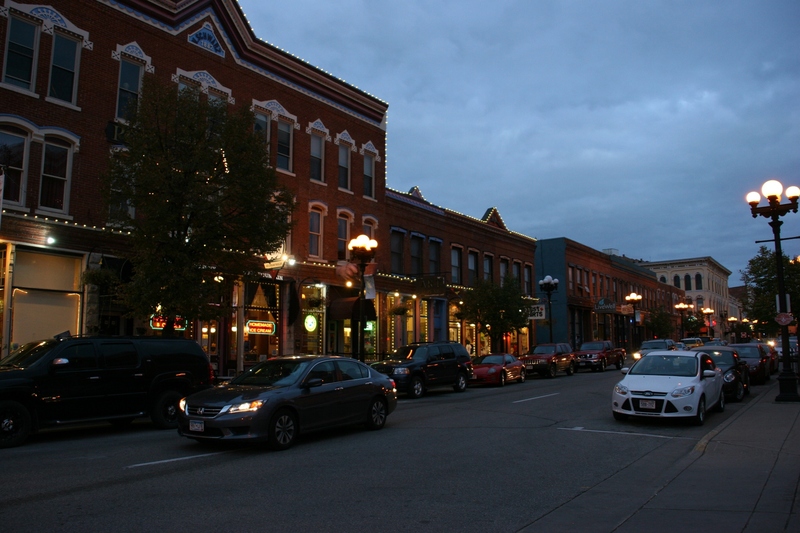 Pearl Street West includes Cheddarheads, a Wisconsin gift shop on the right in this image. 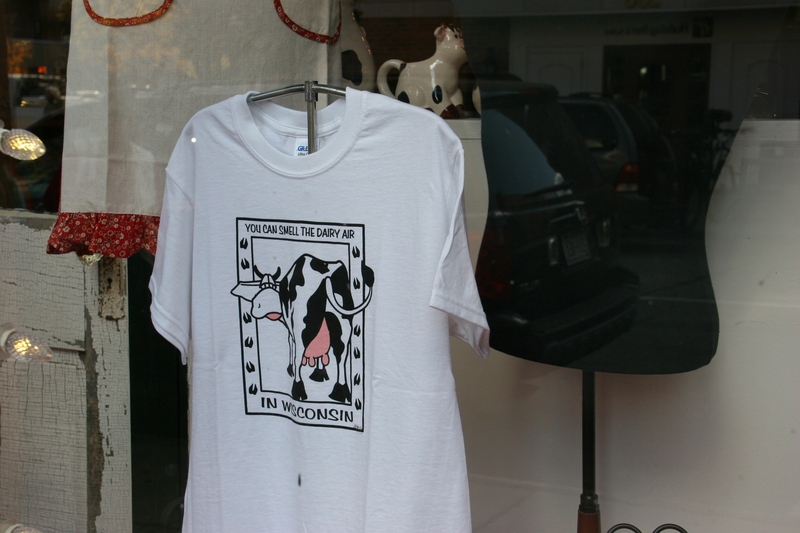 Inside Cheddarheads you’ll find lots of Wisconsin themed t-shirts like this one displayed in the window. 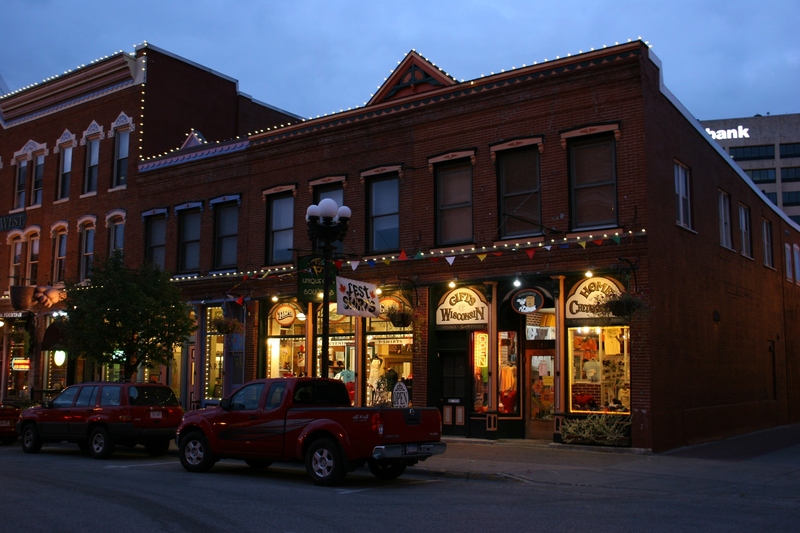 Another view of Pearl Street in historic downtown La Crosse. I love the old buildings and the signage. 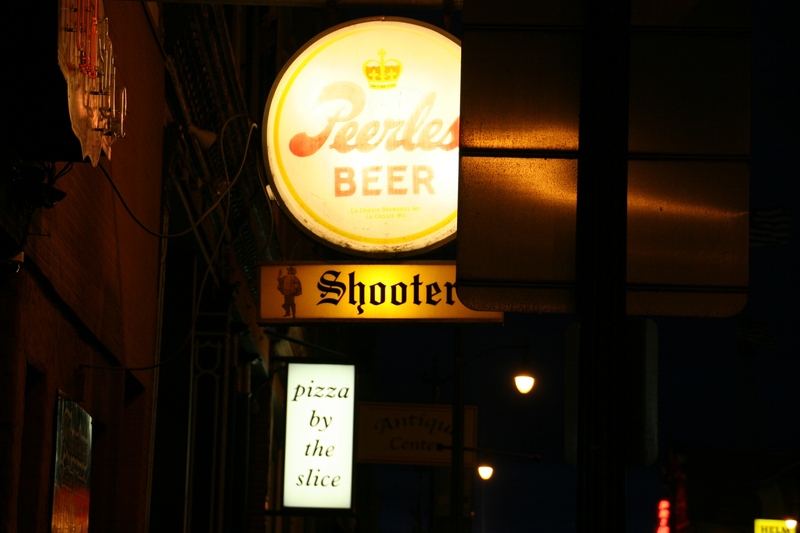 Eventually, after also perusing Art—211 Pearl, in the same complex of businesses known as Pearl Street West, photographing some nightscapes and stashing my camera in the van, we headed back to Buzzard Billy’s with 15 minutes to spare. Finally, we were seated in the noisy bar area, where waitresses, hands balancing large trays of food overhead, squeezed between standing room only bar patrons and tables. It looks like a disaster waiting to happen. While I didn’t care for the bar dining spot, I loved the food. We all did. I chose a spicy Shrimp Creole. Miranda opted for a Crawfish Platter and Randy a pasta with Andouille sausage. Service was quick. It helped that we had our menu choices pre-picked and that I told the welcoming and friendly waitress I was really really hungry. She took our food orders to the kitchen before bringing beverages. Not long after, our meals arrived piping hot. I tried my first ever hush puppies and crawfish sampled from Miranda’s platter. I will confess here that I thought hush puppies were potatoes rather than corn meal. Can you tell I’m a northerner who’s not well-traveled? Another dining option a half a block away from Buzzard Billy’s. Every college town needs pizza places. I love this Prime Rib sign. Once my left-overs were boxed, we headed upstairs to walk through The Starlite Lounge, a 1950s cocktail lounge. Oh, how I wished I hadn’t left my camera in the van. The lounge is now on my list of places to patronize the next time I’m in La Crosse. This throwback setting of curving aqua couches and swivel chairs appears the perfect place to try my first ever martini. 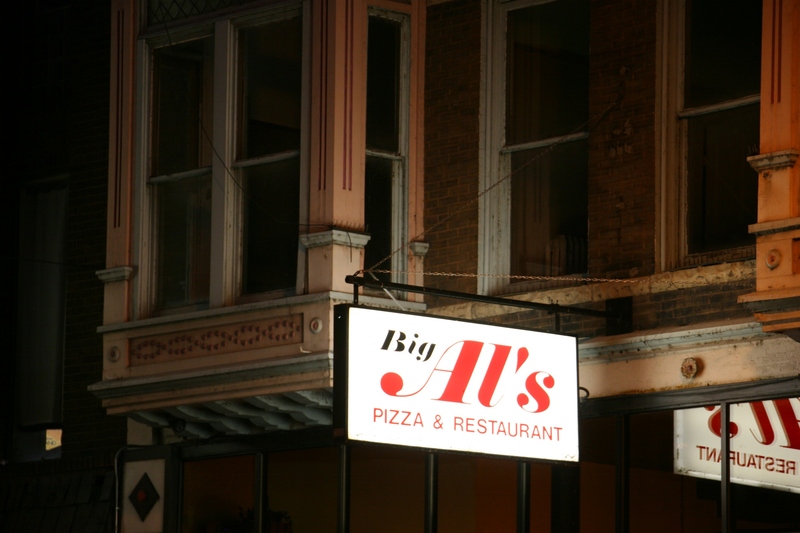 Signage marks another La Crosse bar. 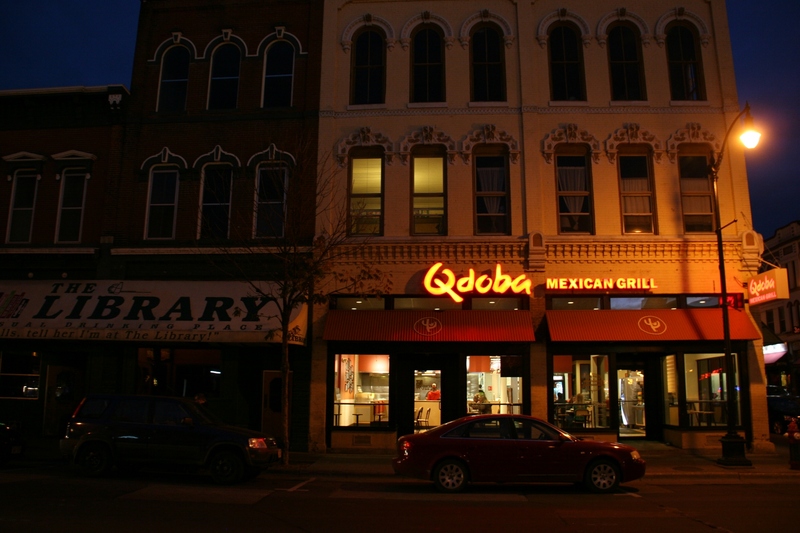 No shortage of places to have a beer in downtown La Crosse. The sophisticated Starlite Lounge seems out of place in La Crosse, known for its beer-focused Oktoberfest and downtown bars frequented by college students. But that’s OK. With so many drinking establishments, bars need to distinguish themselves. And let me tell you, there are a lot of bars in downtown La Crosse. 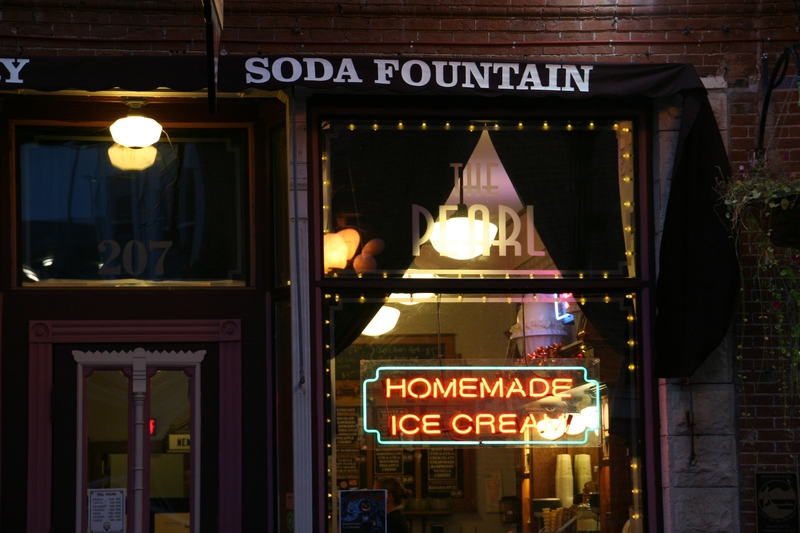 The Pearl, a quaint shop serving homemade ice cream. 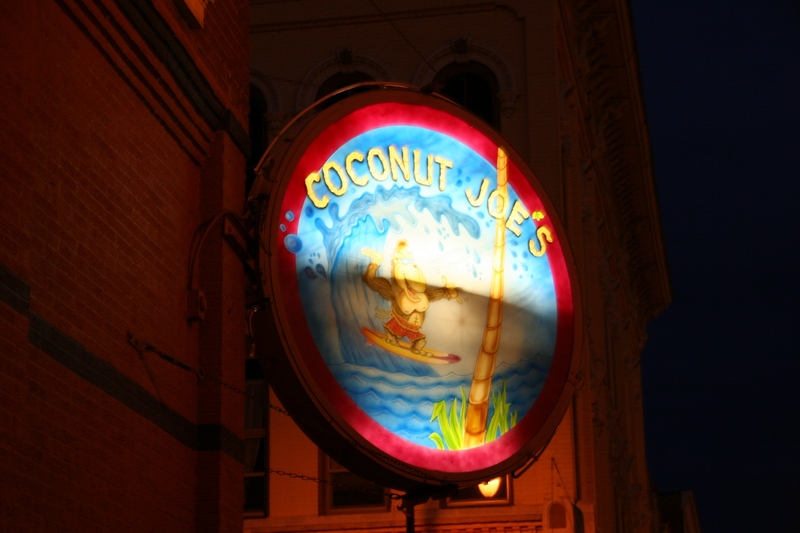 CHECK BACK TOMORROW for a look at another downtown eatery and an ice cream shop. Yes, you would. Lots of interesting t-shirts at Cheddarheads. Thank you, Kim. Yes, we had a wonderful time with our daughter Miranda. So good to see her. 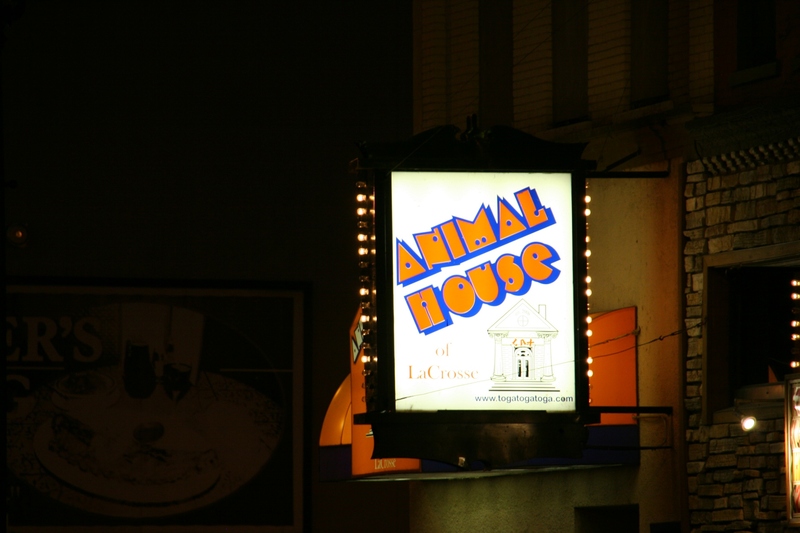 Tsk, tsk… But hey, hush puppies and a martini all in one night. Sounds like a great evening. I didn’t actually have a martini the same evening I tried hush puppies. But I want to have a martini at The Starlite. As for hush puppies, I was not impressed. Yup, their “claim to fame” seems to rely on the # of bars in town!!! We love Buzzard Billy’s (the “Chicken Czarina” is ‘to die for!!!!) but the noise level, especially on weekends, is crazy…..seems to me the design of the place could be modified to eliminate some of the clatter!!!! Parking on the street (especially on Pearl) is really non-existent but, I believe, the ramps are free for the 1st couple of hours and minimal charges after that (far less than what’s charged in places like the Twin Cities). It really is a lovely town during the day but the night life centers on 3rd street and that really leaves us out (the town seems to enjoy their “beer” reputation!). I haven’t been to downtown Lacrosse is a while. Love the signage. 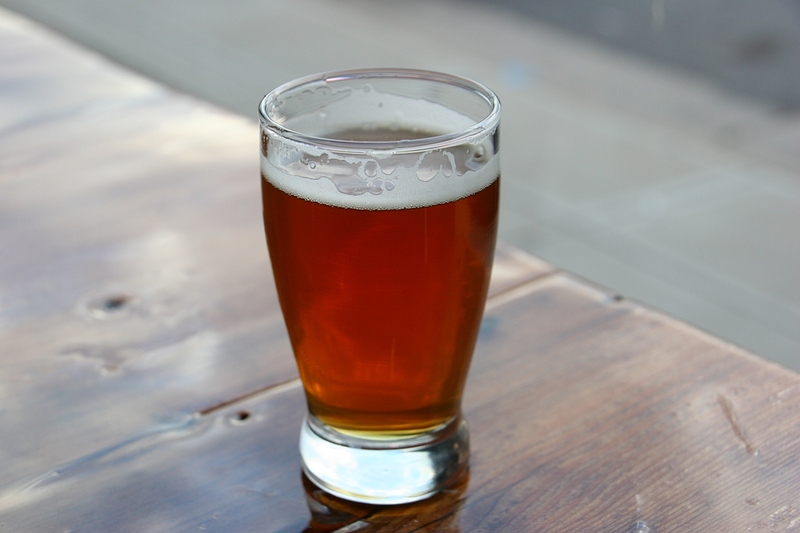 I hear you on the craft beer notion – I am usually can find something I like. A recent favorite is from Shock Top. The Twisted Pretzel Wheat is a unique flavor. It is only available on tap or as part of a variety pack. Parking is a huge deal. I will not visit or drive away from areas where parking is a nuisance. It is a real business killer. I seriously need to try that Shock Top Twisted Pretzel Wheat. That sounds different from any other beers and that’s what these craft breweries need to do– distinguish themselves given so many have opened. The parking situation really proved irritating in downtown La Crosse. A year ago we were in some other Wisconsin town near the St. Croix and there were parking meters. I do not like parking meters. You want me to pay money to park in your downtown to spend money in your shops? Welcome to our city. Not. That is the debate on Grand Ave is St Paul right now. Parking meters are a business killer. Yeah, I’ve heard about that debate on Grand. I agree that parking meters are business killers. Loving your captures – I need a drink now – enjoyed the brewery tour – too bad the brews were not raving 🙂 We plan for parking as part of our travels (i.e. cost, validation, free, etc.). I prefer free parking, but I like when parking garages offer free parking for the first two hours or establishments validate parking for patronizing their establishments. We are in parking meter land down here, so we keep a bag of quarters in the car (some parking areas have pay stations which take credit cards). The one area we go to has no paying the meter after 6 pm. There is a constant battle between businesses wanting business and the areas around those establishments being parking friendly too. Parking is a “thing” now – ha! 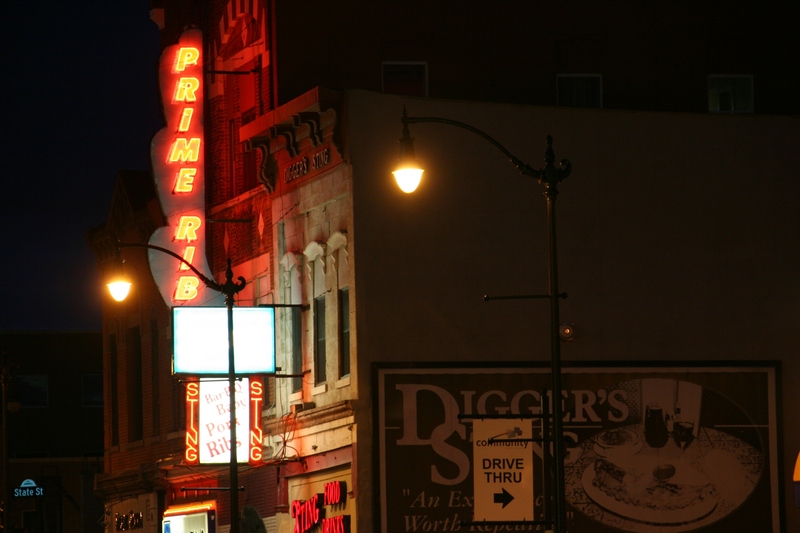 Forget about Sinatra and Chicago being his kind of town.. La Crosse is more my style thank you. Looks like a fun kind of town. It is a fun town.